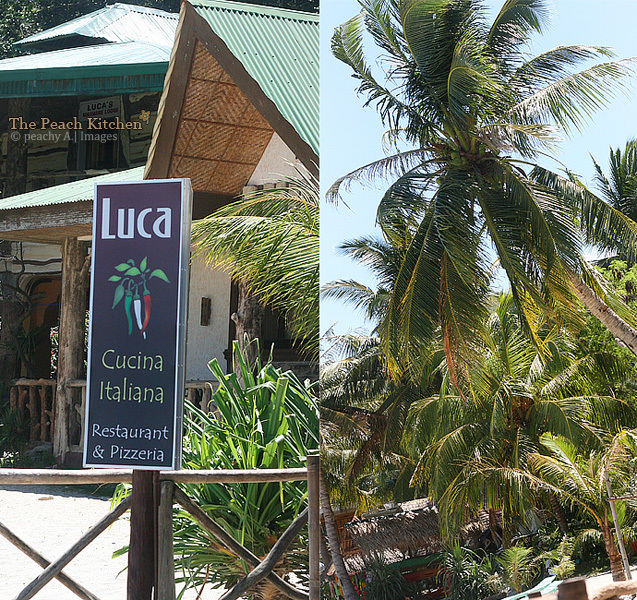 According to Sis, Luca Cucina Italiana Restaurant is popular in Talipanan Beach, Puerto Galera. And why not? 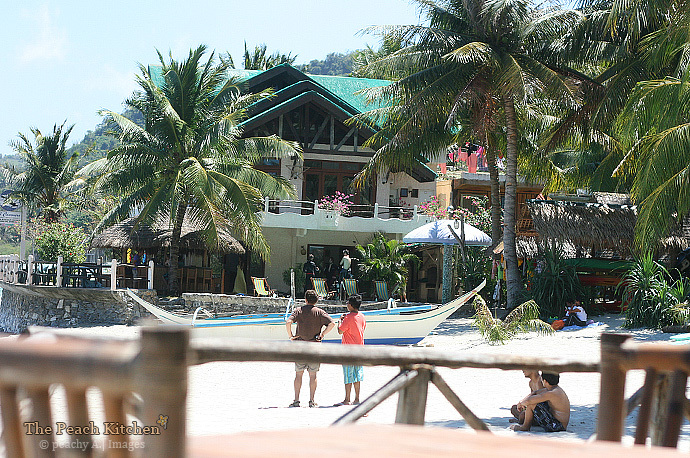 I think it’s just one of the two places there where you can get decent kind of food. 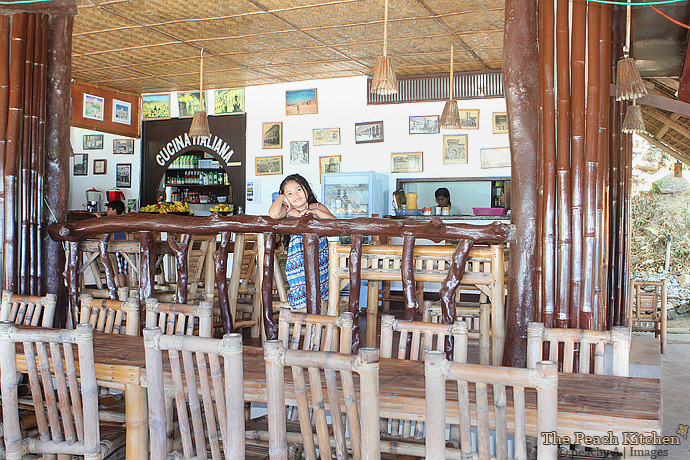 The other one is at Octopus Restaurant, the restaurant at El Cañonero, the place where we are staying. After eating toast, jam and butter for breakfast that morning, we felt that we deserve a great lunch so we headed to Luca. It’s right beside El Cañonero so going there wasn’t a problem. We started the meal with some Fried Mozzarella served with Sweet Potato Fries. I was expecting mozzarella sticks when I ordered it and was really surprised when what came out were three steak-sized deep-fried, thick pieces. There was no marinara sauce to dip it into, so I resolved into dipping it into tomato ketchup. After all, I’m already super hungry. This must also be the reason why there seems to be a lot of carbs going on in lunch that day. 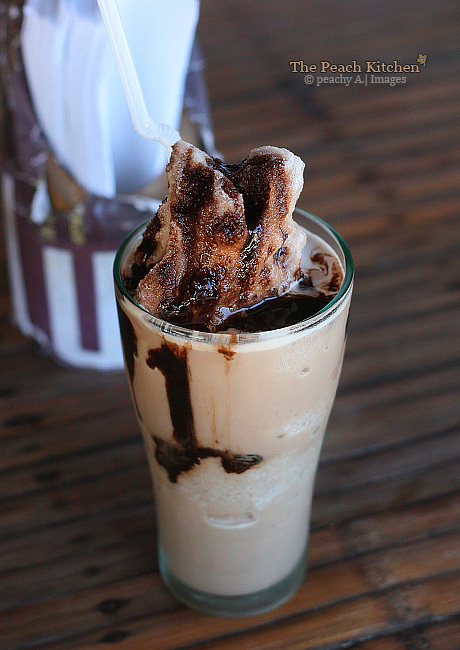 Ykaie had Chocolate Shake to chase the good food down her throat…. which I happily shared with her because the serving was quite big. 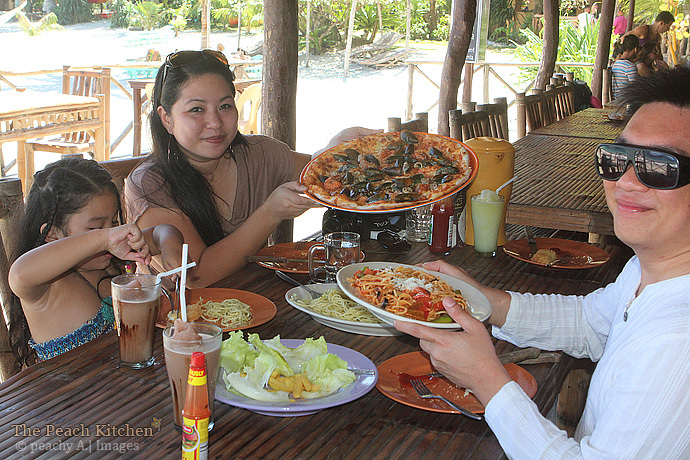 The Seafood Pizza looked amazing with the shrimp, squid, fish and mussels topping that crimson sea of a crust. 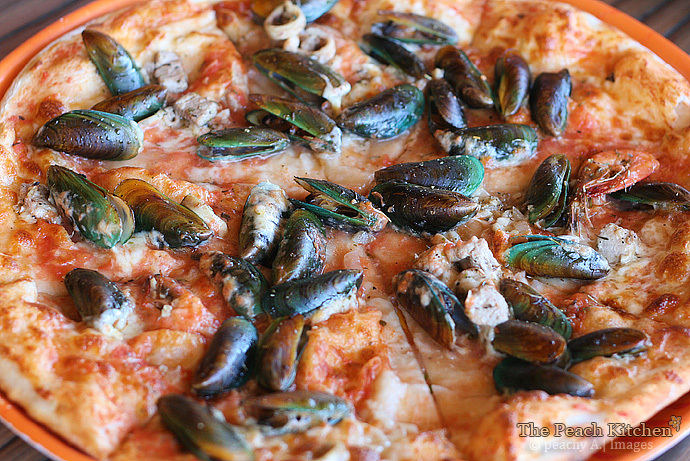 I had to restrain myself from imagining swimming with them and resigned to just enjoy taking the mussels out from the shells one by one, as I eat the pizza. You know, you feed the eyes first when serving food so the presentation must equal the taste. In this case, the presentation left me breathless and the seafood pizza put me into my happy place….. sun, sea, sand, salt, tomato goodness and crusty bread. Yeah, hyphens can be my thing. Don’t judge. The tables and chairs are made of bamboo and it looks romantic at night time with soft yellow lights to illuminate the diners. The spicy Puttanesca only liven up our quiet, laid back lunch. The sourness of the fresh tomatoes hits the sides of my tongue first, the flavor of anchovies, olives and capers followed. My tastebuds were flooded with different food impressions like there’s party and everyone’s invited…. That a band is playing my favorite song with their instruments….. then it suddenly comes to a halt, I was hit with a sudden kick of chili. 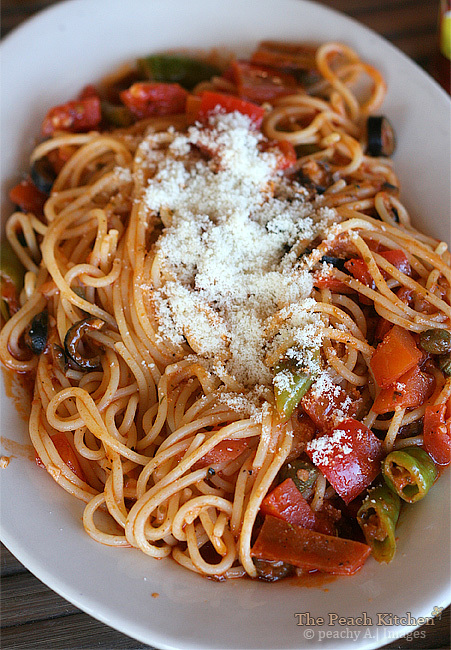 This spaghetti is spicy….and then the heat made me blush. 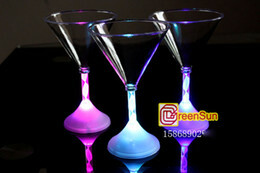 To douse the heat, I took a sip of water. But it wasn’t enough, so I killed it with a forkful of a familiar favorite Aglio Olio Spaghetti, chili removed for Ykaie, of course. 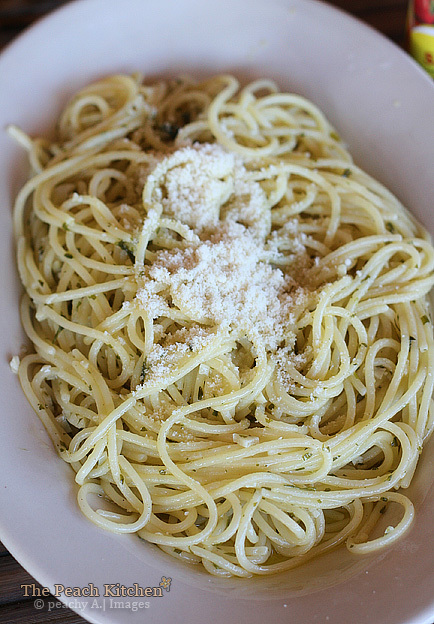 There’s something about olive oil, garlic and parmesan cheese that is so comforting. 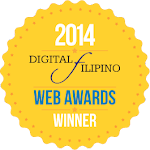 That simple medley of flavors reminds me that life, indeed, can be simple but highly satisfying. That’s the place where we are staying…right across from the restaurant. Interesting how they served the pizza, first time I had seen something like that still on its shells over pasta. Lovely food and restaurant! Yes, that pizza is really original. OMG those food pictures were amazingly yummy. Makes me hungry again! Is that kind of pizza good? The pasta looks really good! great used, its first time i heard about pizza with tahong.. by the way the chocolate shake look yummy.. I love the pizza with many kinds of sea foods on top. 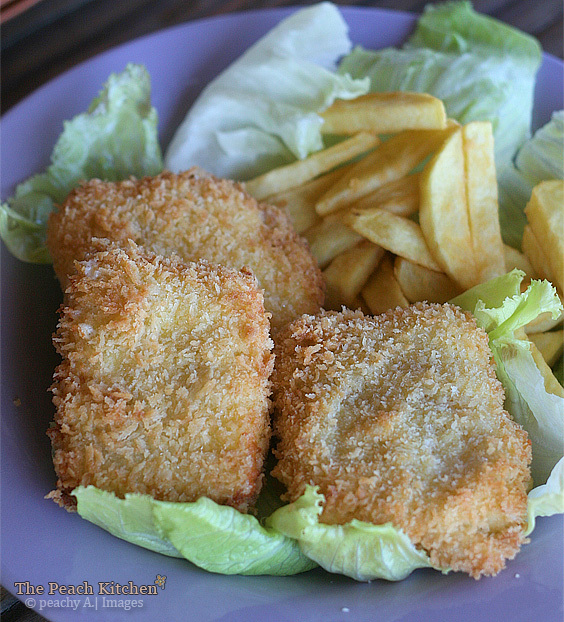 And first time to be heard fried mozzarella I thought it was a fish fillet. What a beautiful place mommy. Looks like one great place to be at. The view, the setting and the mood of the place just looks fantastic. The food looks really good. Hmmmmm… Never seen a seafood pasta before. How interesting! 🙂 Thanks for sharing. I am drooling! LOL! The fried mozarella and seafood pizza look so delish.